Orion is a morning constellation right now, high in the sky if you get up early enough. The three stars making the belt are obvious enough, and just below it hangs his dagger*. The middle star in the dagger is not a star, but a star-making gas cloud of mind-numbing size. There is much to see in the vast sprawl of its 5000 cubic light year volume, including young stars, still going through the pangs of birth. 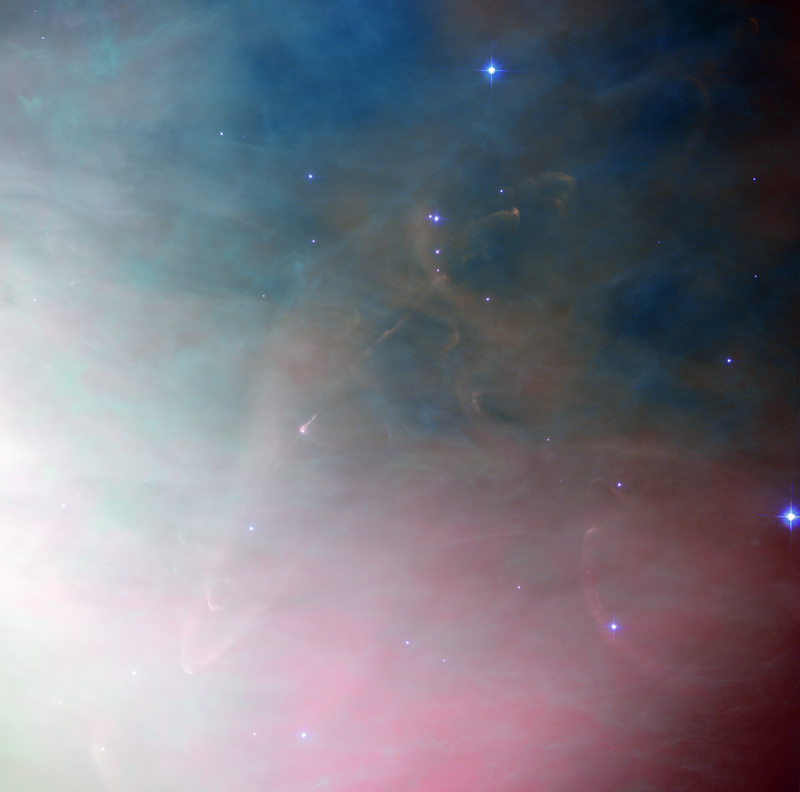 Against the background gas of the Orion Nebula, HH 502, as those of us in the know call it, is almost lost — it’s the star just to the left of center wrapped in what looks like pink gauze (the jets are easier to spot in the full-res version). This image is a tiny, tiny fraction of the entire nebula, but the detail is exquisite. You can trace the jets of gas quite a ways. In real terms, the whole object is roughly a light year — 10 trillion km, 6 trillion miles — end to end. Neptune’s orbit would be a razor thin slice of a pixel on this scale. There’s a lot to see. If you look carefully, you can see arc-shaped features all over the place. These are bow shocks, like the shock wave off the nose of a plane moving faster than sound. That’s usually caused by winds of gas screaming off of stars and slamming into the gas around it. Really elongated ones can be seen, too, and those are associated with the material firing away from the star at HH 502’s center. Those jets are interesting: they are focused by a disk of material around the star far too small to be seen on this scale. But magnetic fields and other forces collimate the outflowing gas into those narrow beams. The flow of gas (which I found in a paper from 2001) is probably something like 400 km/sec (250 miles/sec), fast enough to cross the entire width of the United States in 15 seconds. The total amount of gas in the jets is something like 0.0001 times the mass of the Sun. That may not seem like much, but it’s the same as dozens of Earths! There are knots and clumps of gas, and astronomers have judged their ages to be around a thousand years. The jets are probably older than that, but probably not by much; they’re a short-lived feature of young stars. I got a surprise when I zoomed in on the central star in HH 502. I’ve shown the detailed image here. I expected to see the jet go all the way down to the star, but it actually appears to curve around it! What the heck…? It’s not clear what’s going on, but I think what’s happening is that close to the star is a dense disk of dust – stars form from these kinds of disks. The gas in the nebula itself is flowing; you can see that a lot of the bow shocks are aligned such that the gas must be flowing from the lower left to the upper right. If you look at the HH 502 central star carefully, you can see on the left is another bow shock, and there is a tear-drop shaped flow around it with the pointy end to the right. The edge of the shock pattern is bright, and curves around the star. The jet itself is fainter near the star, so our eye blends it with the curved edge of the shock wave. I’m not positive about this, but that’s what it looks like to me. In larger images, the jets are not completely straight; they can be seen to curve, like a bow. If the star is moving relative to the gas in the nebula, it’ll blow the jets back a little bit, a little bit like the plume of a volcano gets blown by atmospheric winds. All this makes me wonder if the Sun looked like this, once, 4.55 billion years ago. There’s some evidence we were born in a gas cloud like this one, with dozens or perhaps hundreds or even thousands of other stars. Were we once swimming in a miasma of hydrogen, oxygen, sulfur, and nitrogen? Did our Sun shoot out twin beams of matter, tossed around by interstellar currents, blasted by ultraviolet light from massive stars, slammed by subatomic particles from their stellar winds? It’s funny how we can know so much about other stars, but stuck here, billions of years in the future, we only know a little bit about our own star’s birth. But observations like this one from Hubble let us, at least, take a small glimpse into our past. Image credit: ESA/Hubble & NASA. And yes, I know this isn’t technically off the shoulder of Orion; it’s more off his hip. But who can resist quoting Roy Batty’s magnificent final speech if given the chance? * When I was in grad school, a friend of mine would snort in derision every time someone said that. "Sure, a dagger," he’d say.